With Juniper Research predicting in 2018 that mobile operator core revenues will fall by $50 billion over the next 5 years, telcos, ISPs and hosting providers are understandably under enormous pressure to reduce customer churn, attract new customers, cut costs and grow revenues. But how? Telco execs are already scrambling to migrate to the cloud, convert to 5G, integrate AI, analyse big data, adopt blockchain and not get left behind. How are they going to fight customer churn and grow revenue, without dropping the ball on their widespread digital transformation agenda? atmail argues that there is good news on the horizon and the answer might already be a product in your CMO’s arsenal. 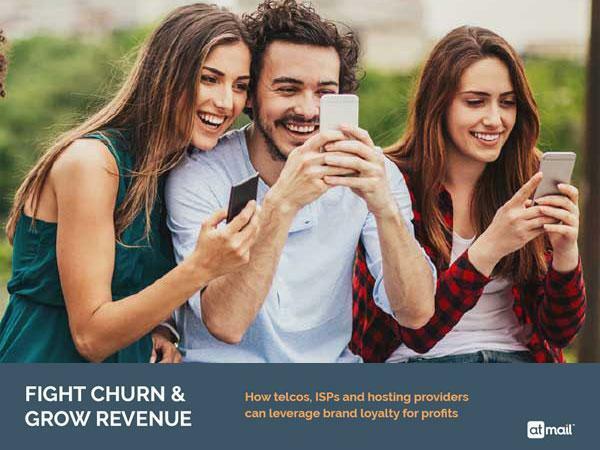 While some telcos are seeing a 1.9% customer churn costing approximately $65 million per month in lost revenue (plus another $76 million in customer replacement costs), others are enjoying a reduced customer churn and 3x spend across their portfolio. To get your FREE copy of our new White Paper please fill the form below and click the Download button. What is your company type?